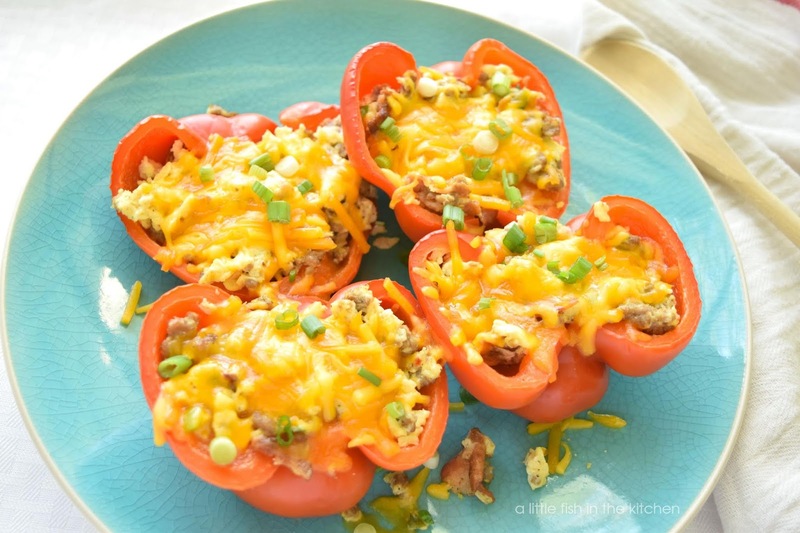 Lately, I've gotten absolutely hooked on these scrumptious, low-carb breakfast stuffed bell peppers. When I say hooked, I mean it, y'all. I've seriously eaten one of these babies for breakfast every single day this week! These breakfast stuffed bell peppers are super easy to make and I honestly love how versatile this recipe is. In the last few days, I've made a few different vegetarian versions of this meal and mixed the scrambled eggs with ingredients like fresh spinach, cherry tomatoes, and green onions. The other morning, I made some stuffed peppers for breakfast (actually if was more like brunch!) with sauteed mushrooms and fresh spinach mixed in with the eggs and then topped them off with melt-y Swiss cheese. Honestly, that's been one of my favorite variations so far. Oh. Em. Gee. It was so yum! Yep, I'm definitely back in love with this classic sort of dish, so I hope you don't mind if a few more stuffed pepper recipes pop up here on the blog (because it's totally gonna happen, y'all). I've love them, but of course my picky kids do not. I know they will come around one day, but there's just no stopping my little kick now! In fact, my all-time favorite recipe for stuffed peppers is one made with a mixture of seasoned ground turkey, fresh mushrooms and rice. And, of course, they are topped with loads of ooey, gooey, melted cheese! Yep, I'm totally craving those comforting cheese-smothered turkey and rice stuffed peppers. So, you can bet your buttons that it's a dish that will be back on the dinner menu very soon! The breakfast stuffed bell peppers I made for this post are slightly more carnivore-inspired as I had quite a bit of leftover breakfast meat to re-purpose from the previous weekend. As it turns out, these stuffed peppers were a good and (very) tasty way to do that! 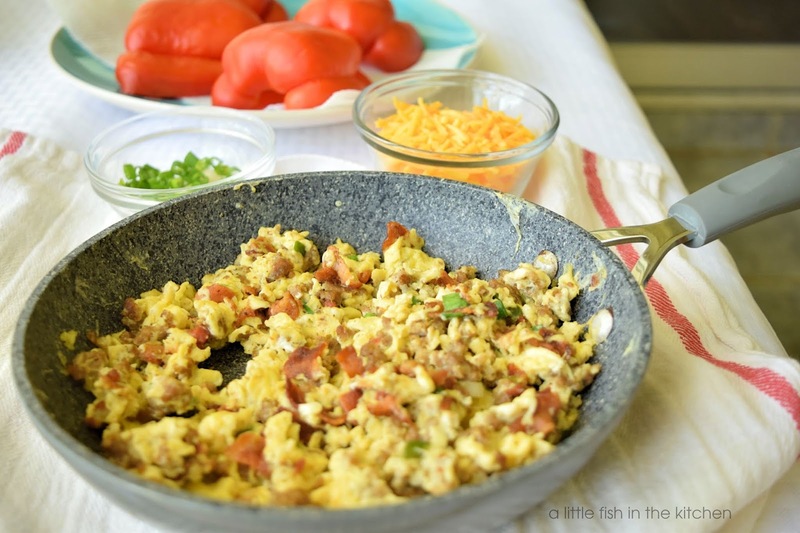 The flavor combination of the sweet red peppers, buttery scrambled eggs, crumbled breakfast sausage, bacon bits and fresh green onion is classic and definitely a winner! Needless to say, this hearty, two-meat version was hands-down Evan's favorite that I've made so far. This dish works well as a make-ahead meal and prepping everything ahead of time will save precious minutes in the morning! Just store everything in the fridge, toss this dish together and reheat in the microwave for a super satisfying quickie breakfast. Trust me, top this scrambled egg-stuffed pepper with a little salsa and this is one delicious way to start your day! Here's my latest YouTube video where you can watch me make this entire recipe! Please subscribe to my channel while you are there! A new dessert video will be out next week. I'm also working on some YouTube exclusive recipes, so I hope to see you all over there so you won't miss out! Note: These add-in ingredients are completely optional. Use the base recipe with peppers and eggs as a blueprint to make your own version. Mix in your favorite ingredients! 1. In a large pot, bring 4-6 cups of water to a rolling boil. Using tongs, place the bell pepper halves into the water and blanch for 3-4 minutes. Remove the pepper from the water and allow to drain (cavity side down) on paper towels. Set them aside. 2. In a small skillet, melt the butter and then place your breakfast meats and green onions (or whatever add-ins you choose) into the pan. Saute for just about 2-3 minutes and then add the beaten eggs and salt and pepper to the skillet. Cook until done. Remove pan from the heat. 3. 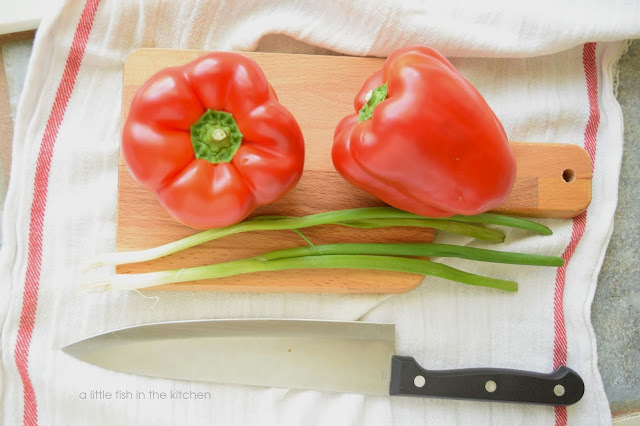 Place the bell pepper halves onto to a plate or small serving platter. Place even amounts of the hot egg mixture into the cavities of the peppers. Top with cheese and garnish with sliced green onions. Serve with salsa, if desired and enjoy! Clink the link below to follow me by email so you'll never miss a post! SO yummy, healthy and awesome for any meal! Hi there Angie! Thank you! Not only do these look delicious but they're healthy too! My hubby and I have been on a fitness journey since January and this recipe would fit right in our meal rotation with no problem. Thanks for the recipe! what a lovely way to enjoy scrambled eggs! 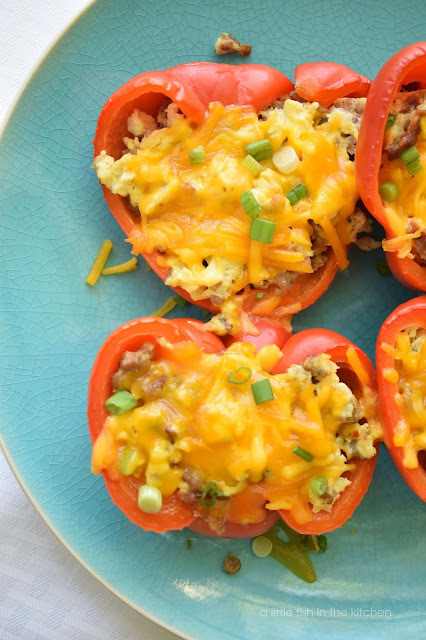 These stuffed peppers look colorful, delicious and like a real fun way to enjoy breakfast! Hope you and your family is doing well! Hello Andrea!! Thank you for your visit and for the comment!! Wow, neat dish! I'm not a fan of huge breakfasts, but would love to have this for dinner. Thanks!